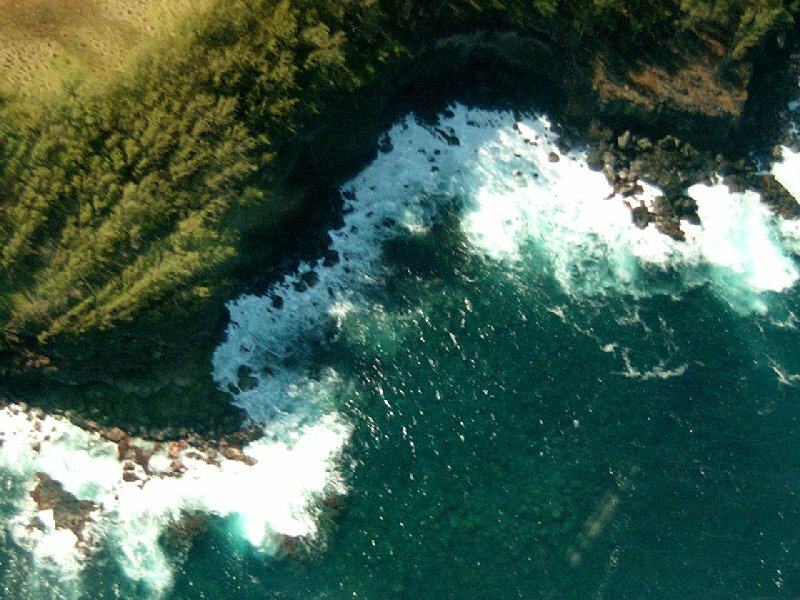 Back before the days when jumbo jets shuttled their flocks of tourists over to the Islands daily, going to Hawai'i was both more special, and more leisurely. My first trip was with my parents when I had just graduated from high school. We didn't go on the Lurline or one of the other big luxury liners which plied the route. Instead we booked passage on a couple of freighters, going over on the Kaimana, and returning on the Lanikai. 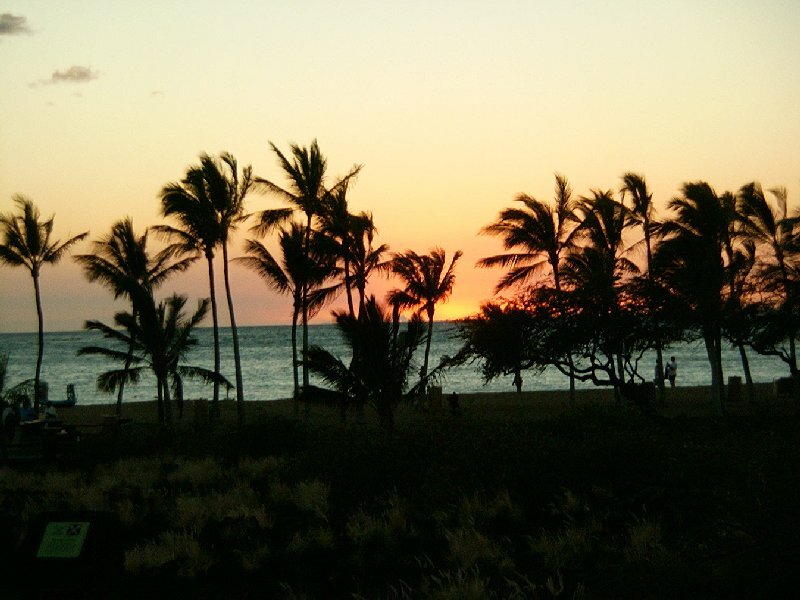 The tradition then was that, as you sailed away from Honolulu, you would cast your lei on the waters, and if it washed back to shore, you would return to the Islands. We had hardly cast off from the pier than my lei dropped into the waters of the harbor. I wasn't taking any chances: I wanted to make sure that I returned. It worked. 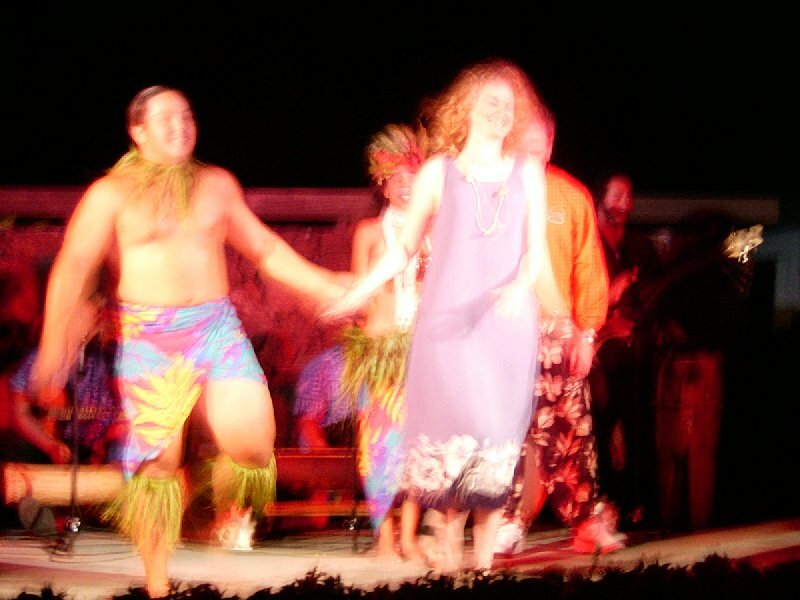 This was my sixth trip to the islands, Marie's second, and the first time for Polly and Jennifer. 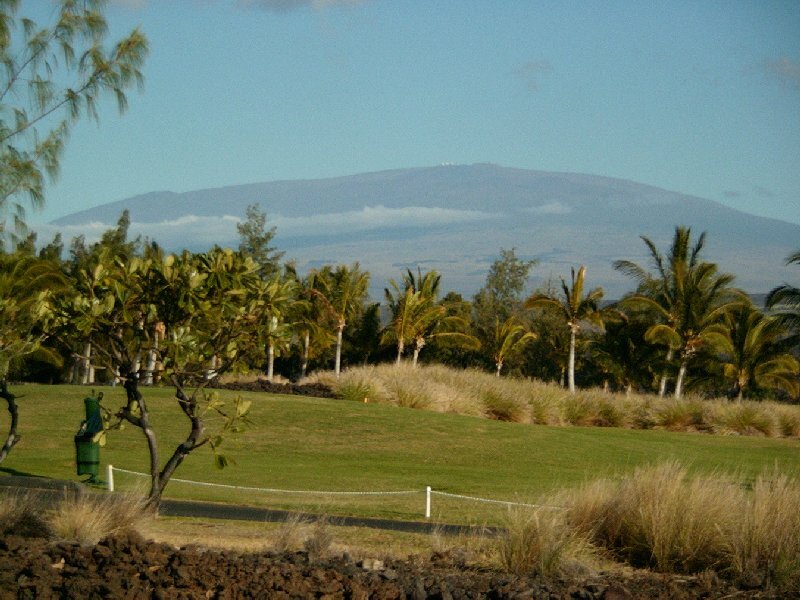 We took a week in January as a Christmas present to the whole family, and spent it in a condo on the Kohala (northwestern) side of the Big Island, in Waikoloa Village. 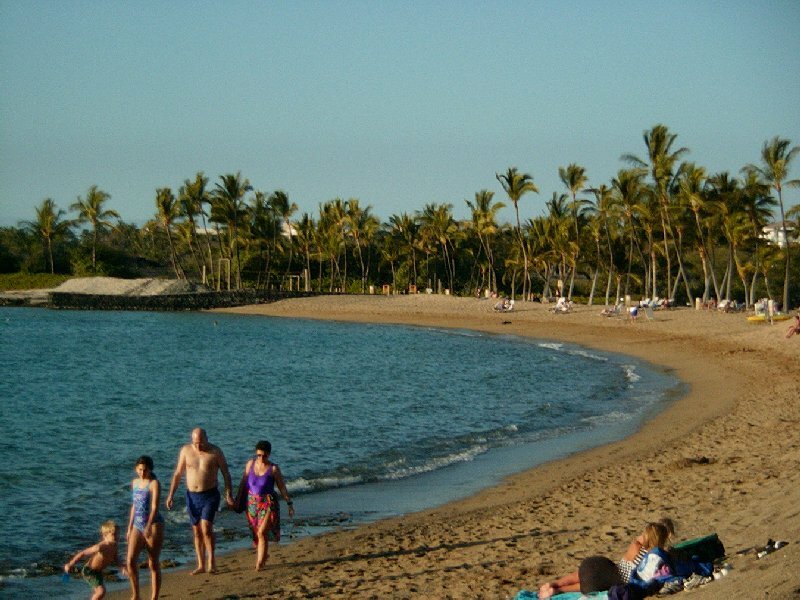 I scheduled our flights so that we had a six hour layover in Honolulu between the flight from the mainland and the inter-island hop down to Kona. I hired a limousine and we went on a tour of Oahu. We then flew to the Kona airport, picked up our rental car and found our condo. The next morning we fussed around with mattresses for a while, and then headed off for some snorkeling at Kealakekua Bay, sometimes called Cook's Bay, since that's where Captain James Cook was killed. 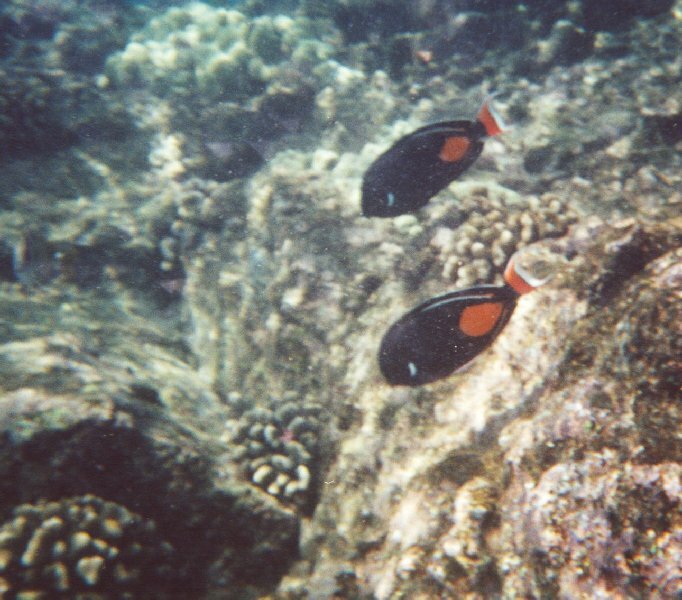 I took along my underwater camera, but didn't get any pictures because the film wasn't threaded properly. Live and learn. Luckily Marie got this picture. Jennifer and Polly swam out towards the center of the bay while Fritz stayed near the shore. Polly came back after a while, but Jennifer swam out a little further with a young man who volunteered to be their guide. 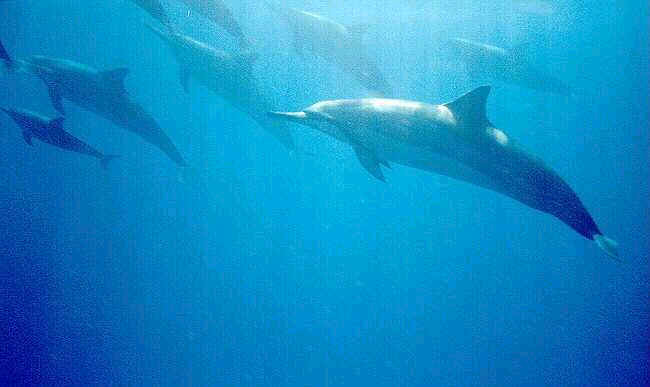 Suddenly she found herself swimming in amongst a pod of Spinner Dolphins. She was thrilled! Meanwhile Marie headed back up the coast and checked out the fabric shops in Kailua. Tuesday was our anniversary, so, to celebrate we took a helicopter ride from Kona, over the saddle between the two big mountains to the active volcanoes on the southeastern coast, back up along the lush northeastern coast, and then home. This was the high point of the trip for us (except maybe for Jennifer's dolphins). 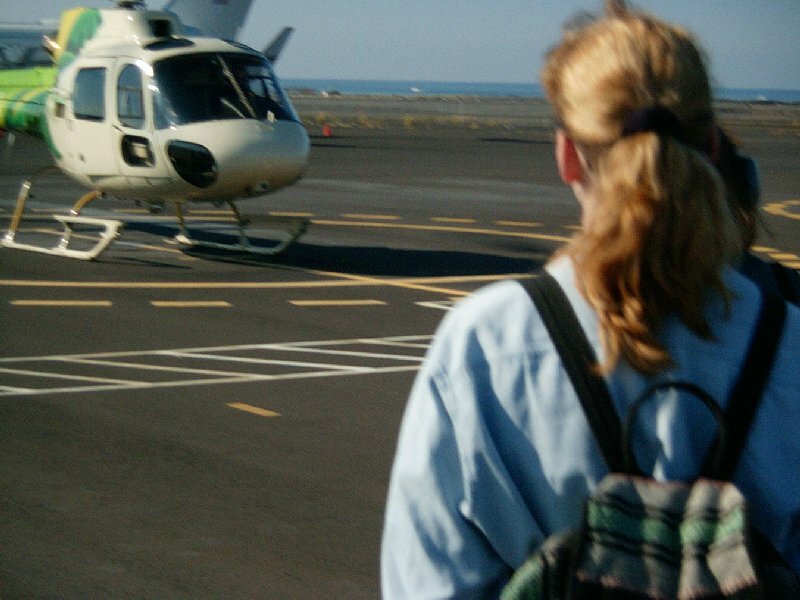 The sensation of taking off in a helicopter is completely different from fixed wing craft. One moment you're on the ground, and the next moment you're flying, going anywhere you want! The views were unparalleled; we saw things as we could not have seen them any other way. We were concerned about noise, vibration, stability and such. Captain Dan took care of us. We each had noise canceling headsets, and then he piped in soothing music to keep us calm. The flight was smooth, and the three of us who are terribly susceptible to motion sickness felt no discomfort at all. Take a look at our pictures: we passed over desert, lava flows, and rain forest. 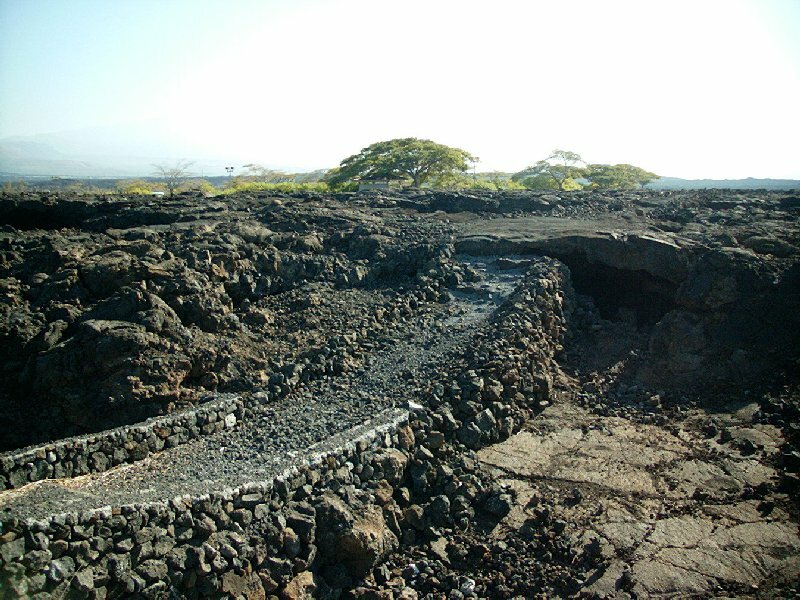 The big Island has a very large collection of climatic zones. As we drove around later we joked that there should be signs reading "Now entering Temperate Rain Forest" or whatever since we changed zones every twenty miles. Wednesday the girls had arranged for a trail ride. 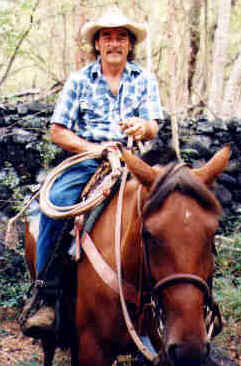 We drove back down to the Kealakekua area and found the tack shop run by Bones, an old paniolo (Hawaiian for cowboy). He told us that he doesn't have to advertise locally much any more: he gets all of his business from the web site he put together: www.konacowboy.com. While the girls rode down to the bay snorkeled, and then rode back, Marie and I headed on to Honaunau bay. 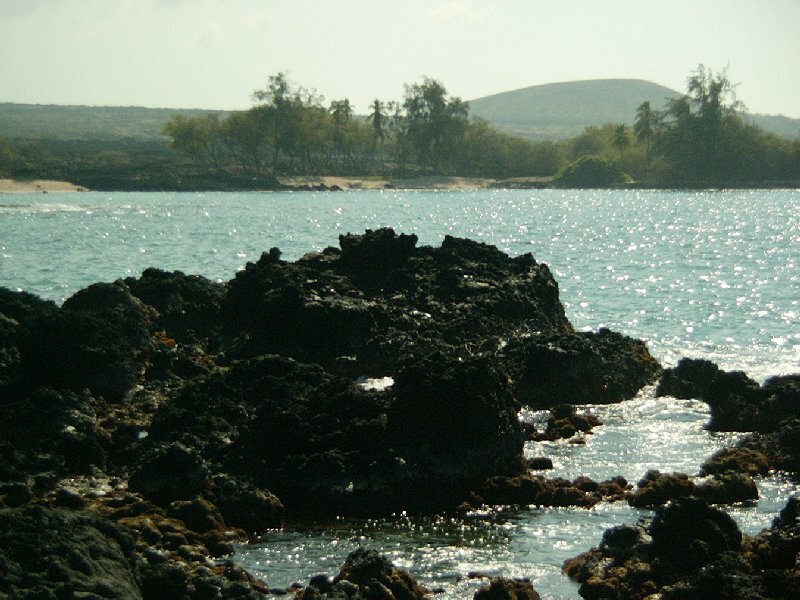 Along the south side of the bay is the Pu'uhonua o Honaunau, or place of refuge. In olden days taboo breakers could escape the death sentence by fleeing to the refuge and atone for their transgression in service to the Gods. We had visited the place of refuge on a previous trip, so we went to the boat landing next door and got in the water. To our amazement there were large green sea turtles swimming around in the shallow pool next to the landing! Since it had been many years since Marie had been swimming, she was content to wade around amongst the turtles while Fritz went out for a look at the reef fish. 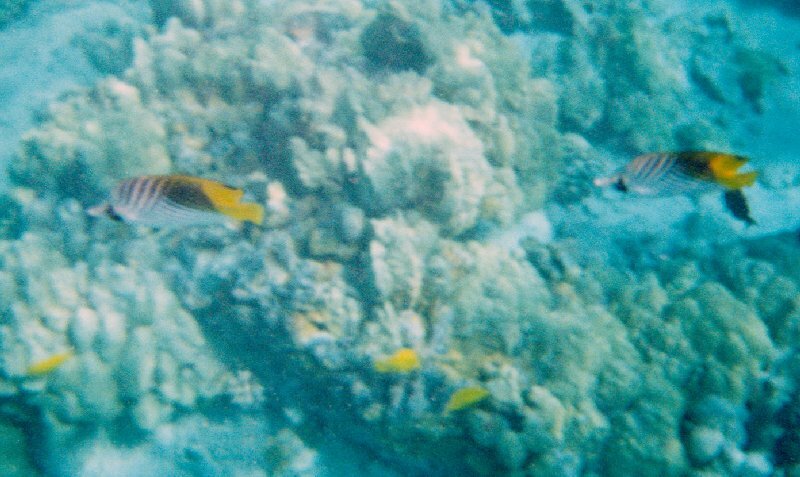 The camera was working, the water was clear, the fish were numerous, the coral provided a colorful backdrop, it was all perfect! I dove down a couple of times, snapped pictures, swam near another sea turtle. Wow! However, when I crawled out on shore, I discovered to my dismay, that somewhere out there, the keys to the rental car had dropped out of the pocket of my swim trunks. The car wasn't locked, but we weren't going anywhere, and the girls were stranded at the horse place, a situation that didn't bother Jennifer nearly as much as I thought it ought to. We looked around, aided by some kanakas (good ol' boys) who were hanging out there. No luck. I walked over to the national park and phoned Dollar Rent-a-car. They would make up a key and send it down to us in a taxi. We had to pay the driver. We sat around, admired the scenery, watched the other divers, and worried about how much a thirty mile cab ride would cost. After a while I noticed that there was no cab. So I walked back over to the pay phone and called Dollar again. "Oh, I'm glad you called. We can't make keys for the model of car you have, so we called for a two-way tow. You take the car he's towing down there, and he'll tow your car away." I came back and told Marie the news. Just then a scuba diving couple came back to the car next to ours. 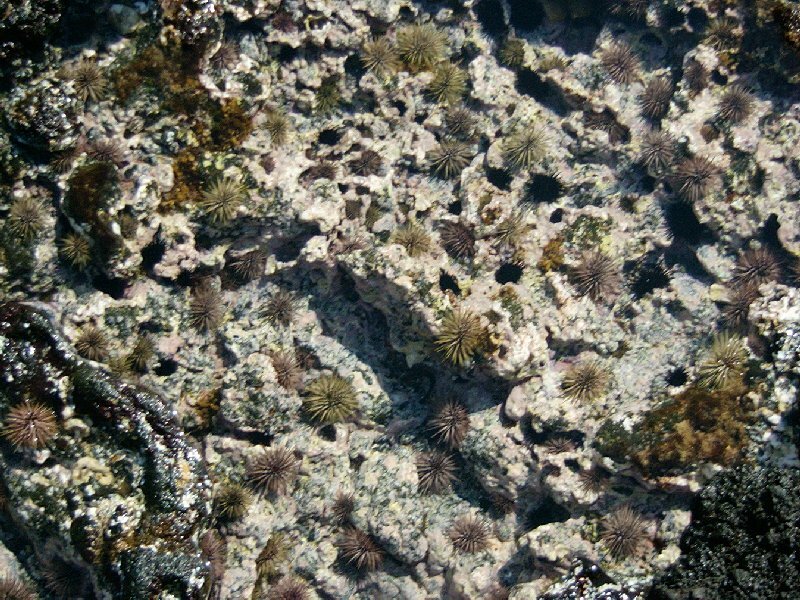 He had retrieved a car key sitting on top of a coral head. It was ours!! Quick phone call to Dollar, aloha and mahalo to the kanakas and we were off to pick up the girls, rejoicing in our good fortune. I believe in miracles. Kalua Pork, Kalua Turkey, Pulehu Chicken, Island Mahimahi Island sweet potato, fried rice, potato salad, pasta salad, Hawaiian coleslaw, lomi lomi salmon, tossed island greens, fresh pineapple and papaya, Portuguese Sweet Bread and poi. 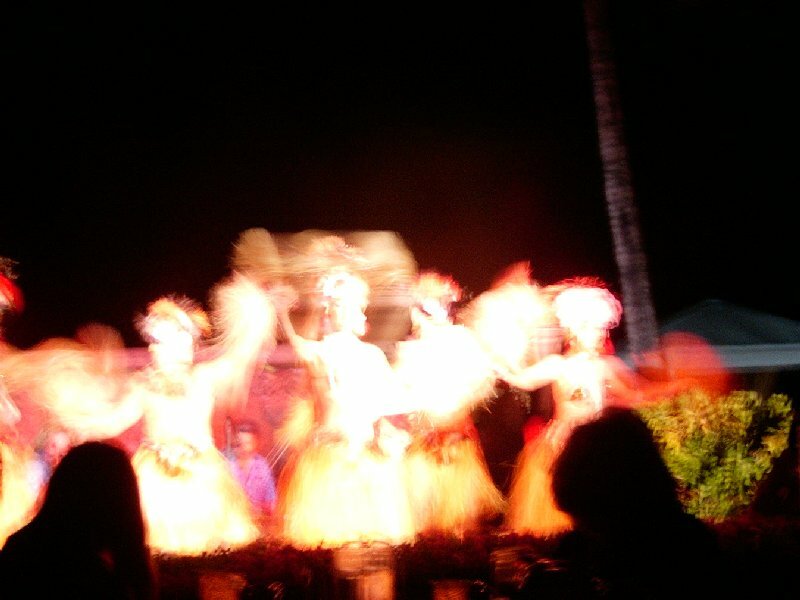 After dinner there was the Polynesian dancing show, featuring dances and songs from Tahiti, New Zealand, Hawaii and Samoa. The Samoan fire dancer stole the show, of course. 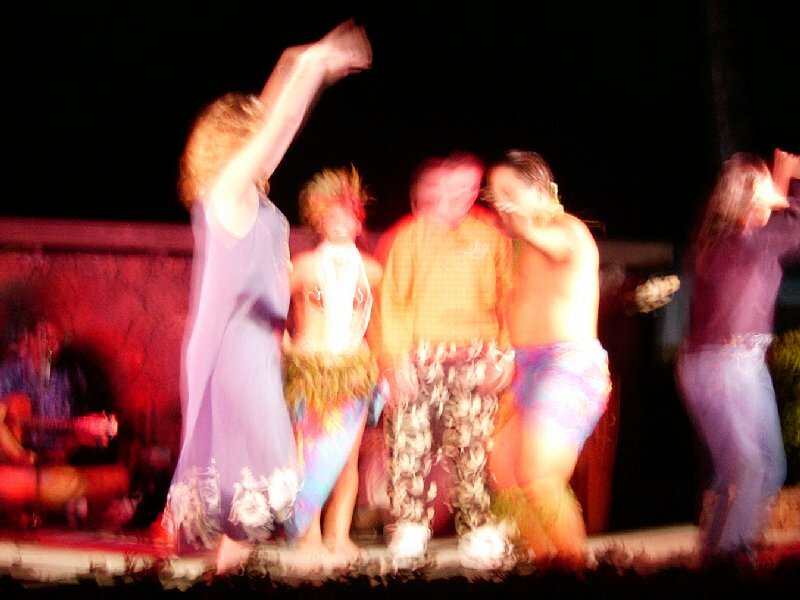 Then they grabbed some tourists to come up and learn to Hula with the performers. Polly was picked and did a fine job. It's Thursday and time is slipping by. This is our day to drive over to see the volcanoes close up. 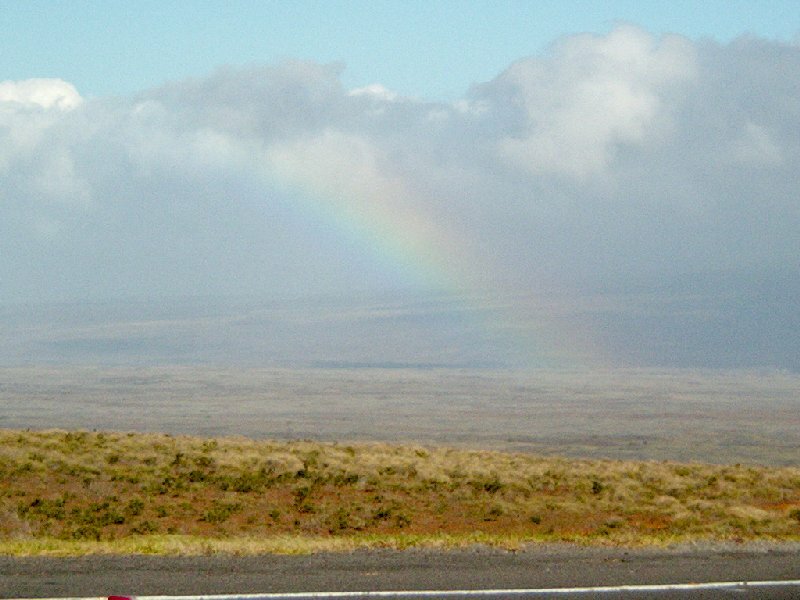 As we drive northeast across the desert surrounding our resort, we see a full rainbow in the rain falling on the Kohala mountain north of us. It is an auspicious start. 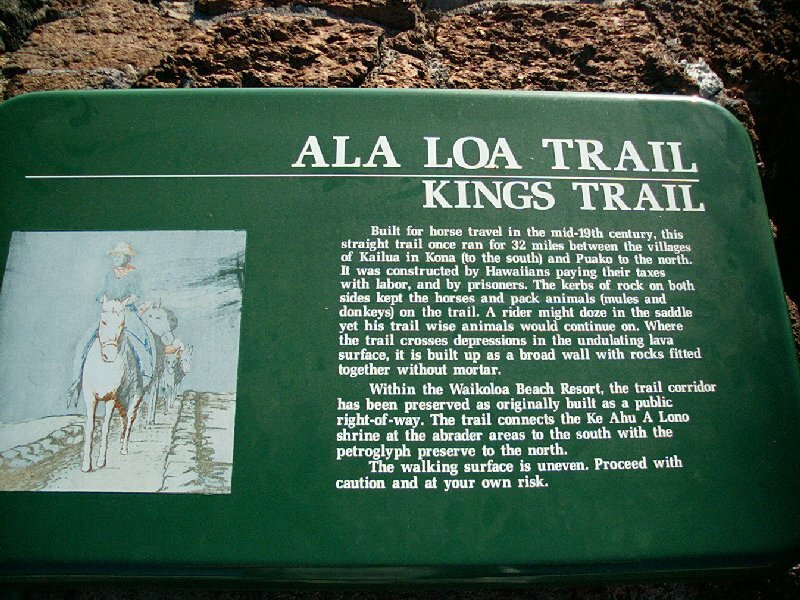 The desert road leads us into Waimea some times still called Kamuela (Hawaiian for Samuel) after an early settler. We turn right and emerge in fine dairy cattle country. This changes into a temperate rain forest as we come to the end of the road on the edge of the Waipi'o valley. 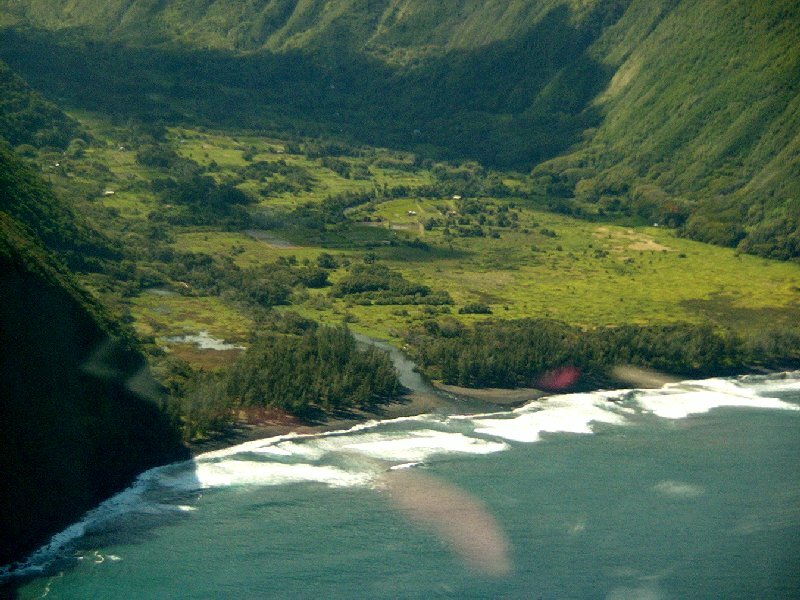 The Waipi'o Valley has been inhabited for over 1000 years. 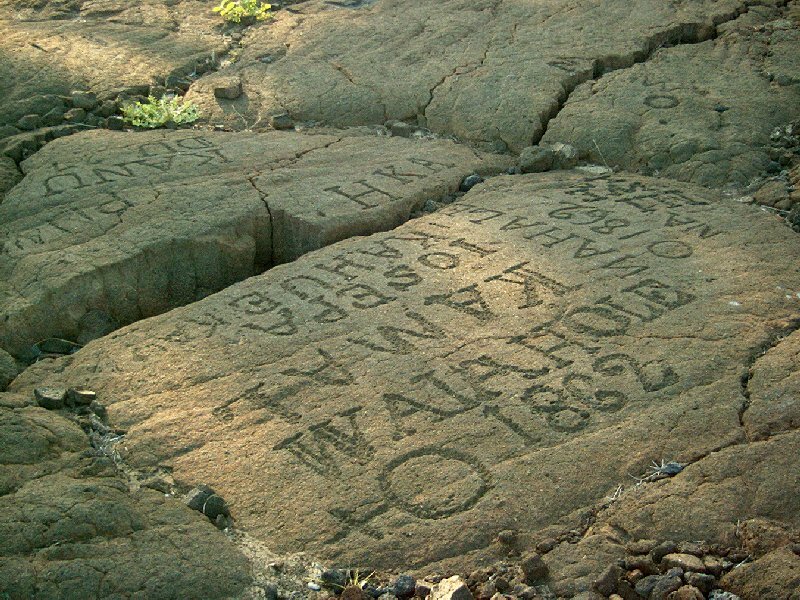 Waipi'o was the traditional land of Kamehameha the Great. He came here to rest after battle. 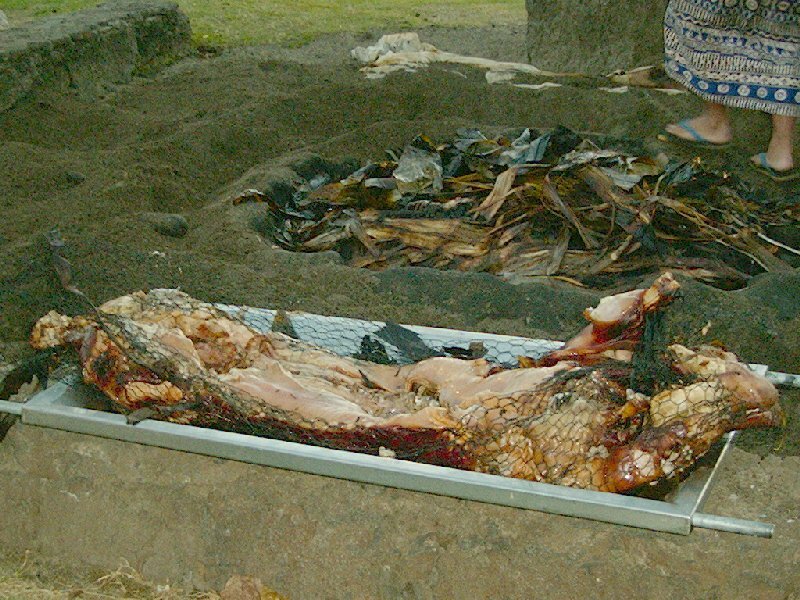 When Captain Cook came to the Island in 1798, 4000 natives lived in the valley; a century later only 600 remained. 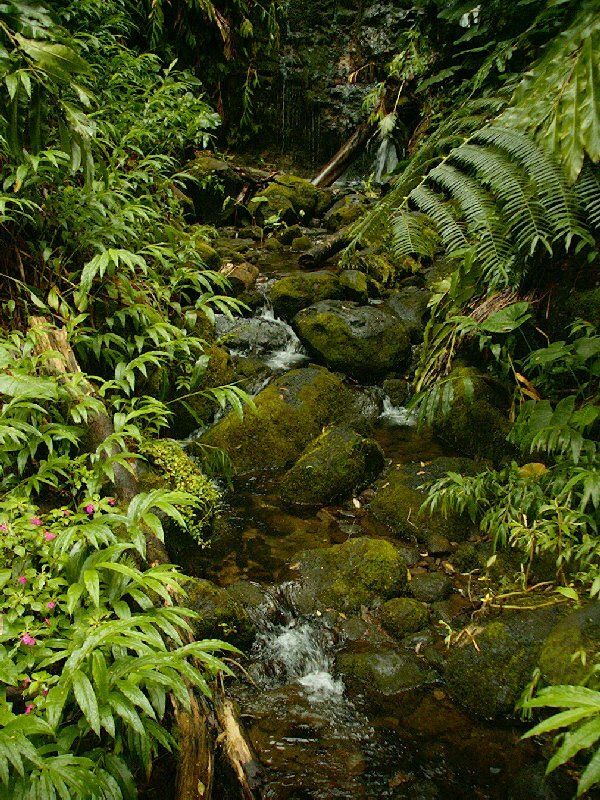 Around 1900, many Chinese and Japanese came to the valley to raise rice and taro (the source of poi). 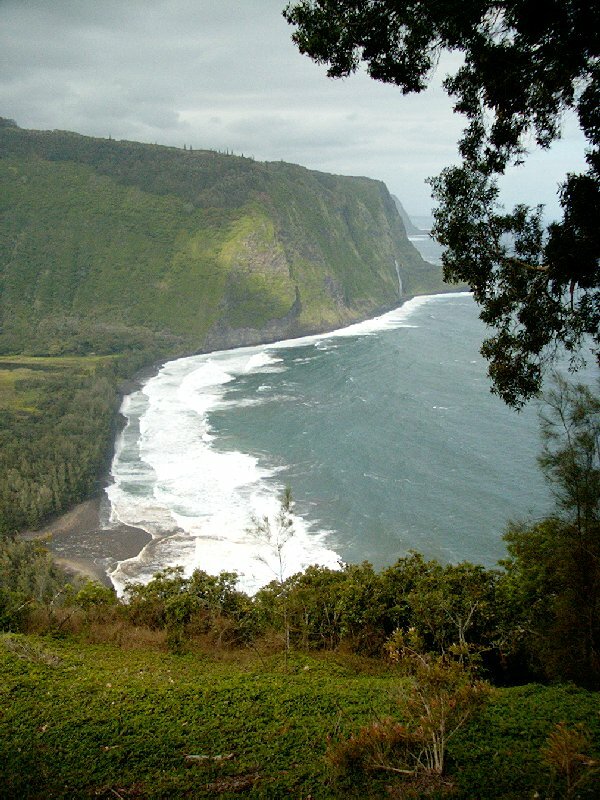 On April 1, 1946 a tsunami swept away almost everything in the valley and it was virtualy uninhabited for 25 years. The 60's and 70's brought the "back to nature" hippy crowd who were handed a reality check in the form of the flood of 1979. 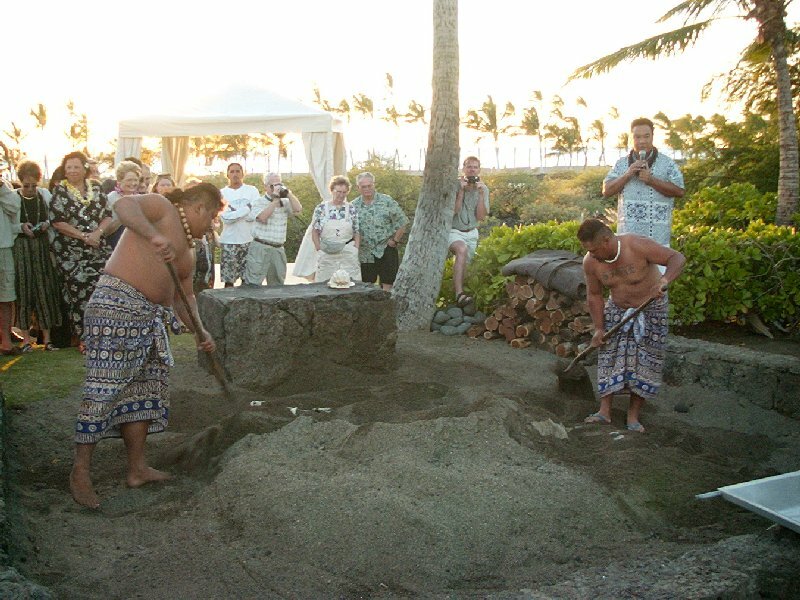 Waipi'o is unpredictable, and its current inhabitants go on knowing full well "...there will be a next time." 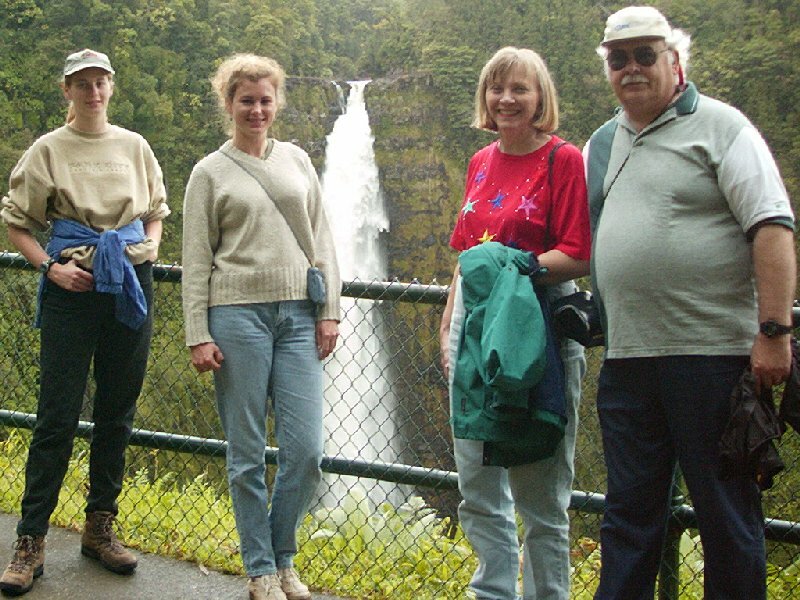 Our next stop was Akaka falls, north of Hilo, right in the middle of the rain forest. 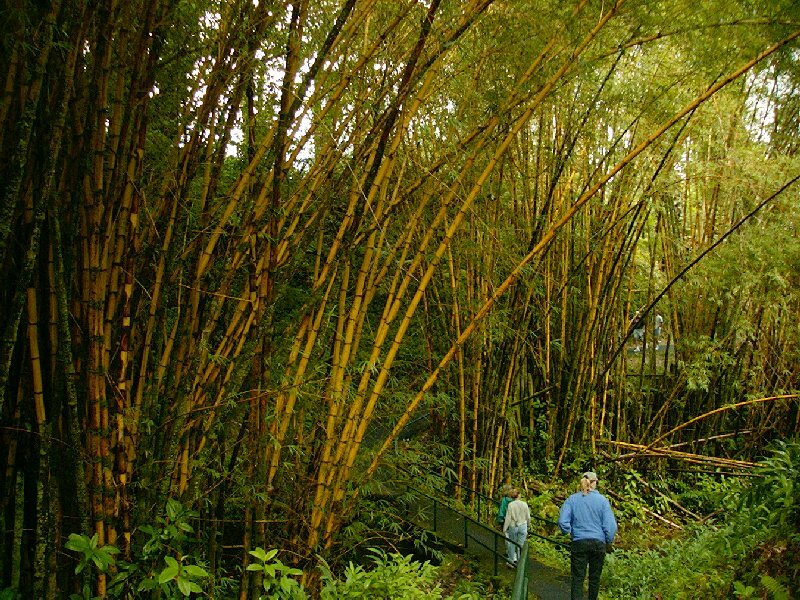 Timber bamboo grew over 30 feet high. 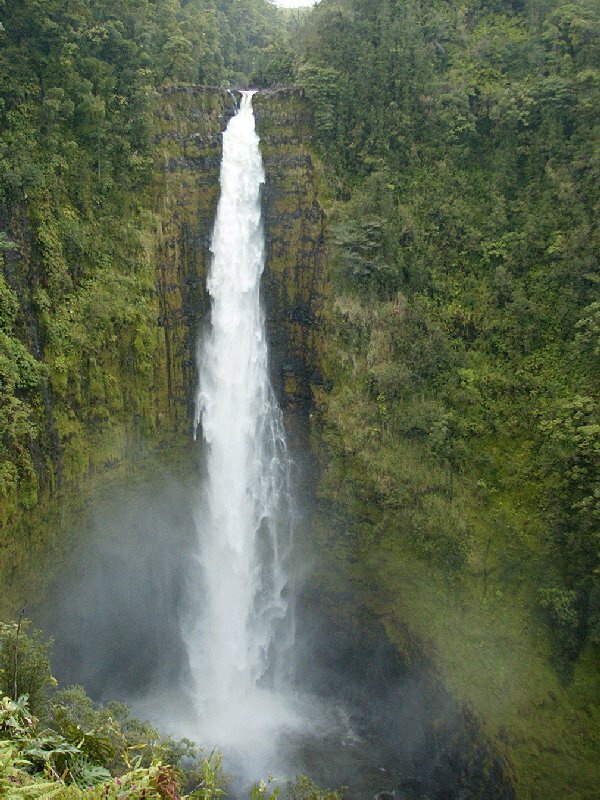 Then you come to the falls where a torrent plunges 420 feet into a mist-shrouded pool. Giant philodendron, wild orchids and all sorts of tropical plants grow along the half mile loop trail to the falls. We stopped for lunch in Hilo at a place listed in our AAA guide (the only use we made of the tour guide on the whole trip). Cafe 100 is a drive-in that specializes in "Loco Moco" a plate of rice with a hamburger patty, an egg, and gravy. They have a lot of variations. We ate well, but the girls didn't like the passion fruit chiffon pie. Hilo is the biggest city on the Big Island, but it is not a tourist destination. It has a good harbor, an airport that supports flights to the mainland, and looks like most any small, rural city. Heading south, our next stop was Volcanoes National Park, which we had previously over flown in a helicopter. 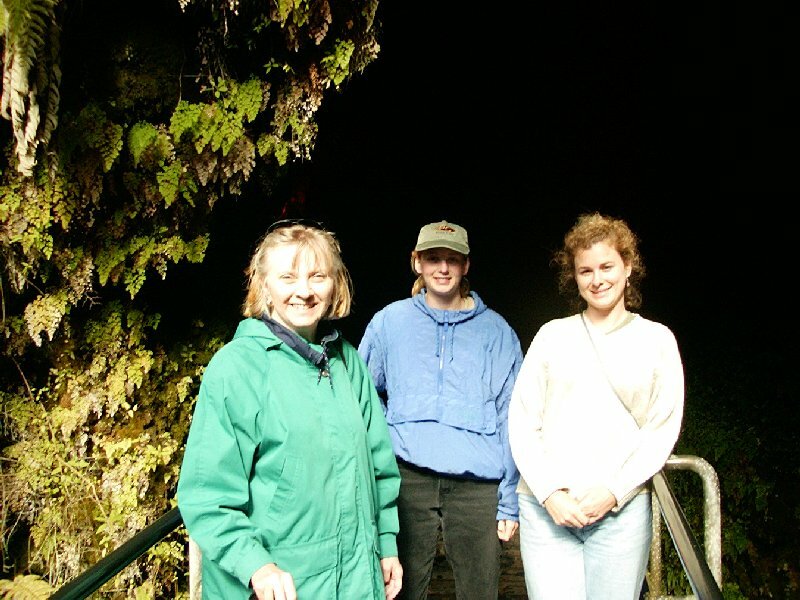 Here the rain forest produced tree ferns and other luxuriant greenery, but the main attraction was walking across the floor of the Kilauea crater to view the pit where the lava had subsided after its last eruption. See the Lava page for details. We finished our circle island tour by driving through the Kau desert, around past South Point and on up the Kona coast to our condo. It was dark for the better part of the drive. I don't have much recollection of Friday. We bummed around, visited a few places, shopped, played tourist, and really relaxed. The girls went snorkeling again and got in some beach time. It was great; a real vacation! Friday evening the girls rented a car and took off to explore the night life. I don't think they found much action, at least that's what they told us the next morning. Saturday the girls went to the beach. 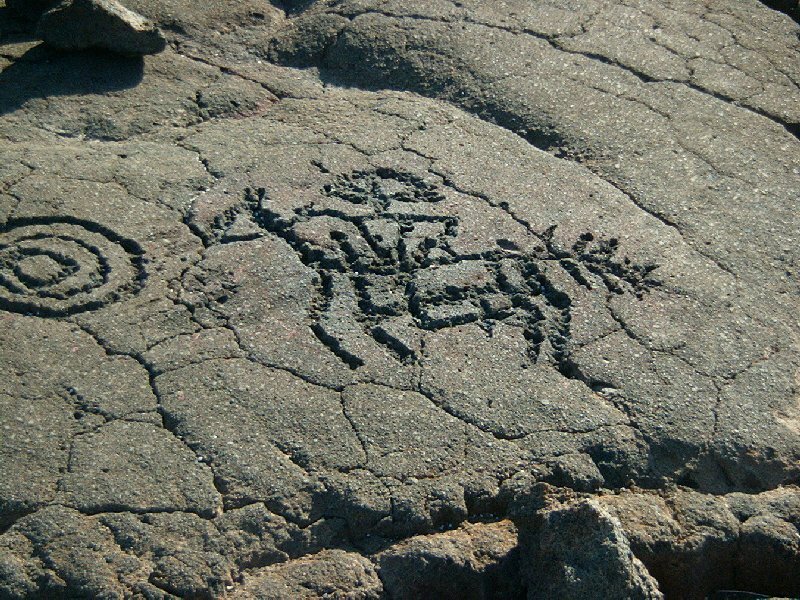 Marie and I had a nice walk along a couple of beaches and visited the Petroglyph preserve in the Waikoloa Beach area. 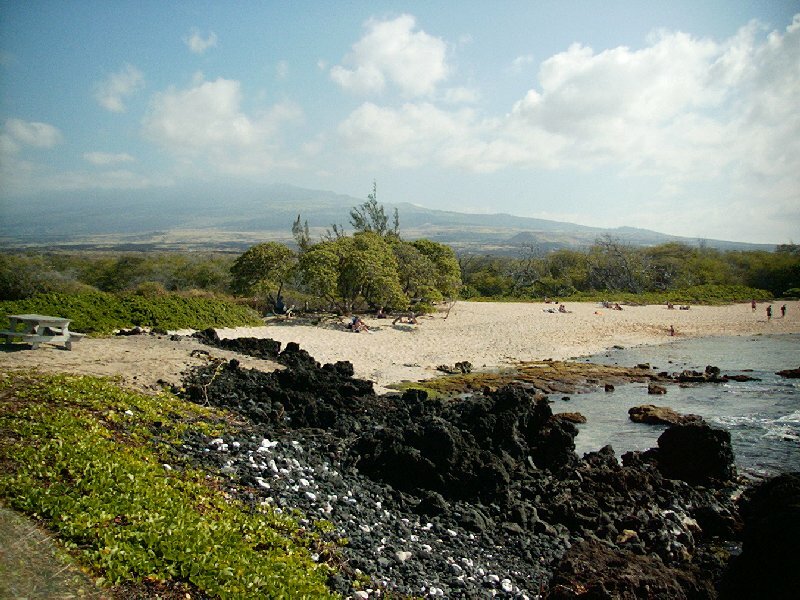 The Kohala coast, where we were, has some of the best beaches on the Big Island. Of course the beaches on Maui or Oah'u are even better, but they don't have to put up with periodic infusions of hot, molten rock. Where the lave meets the ocean it eventually gets pounded down to black sand, but before that it forms some neat tidal pools. 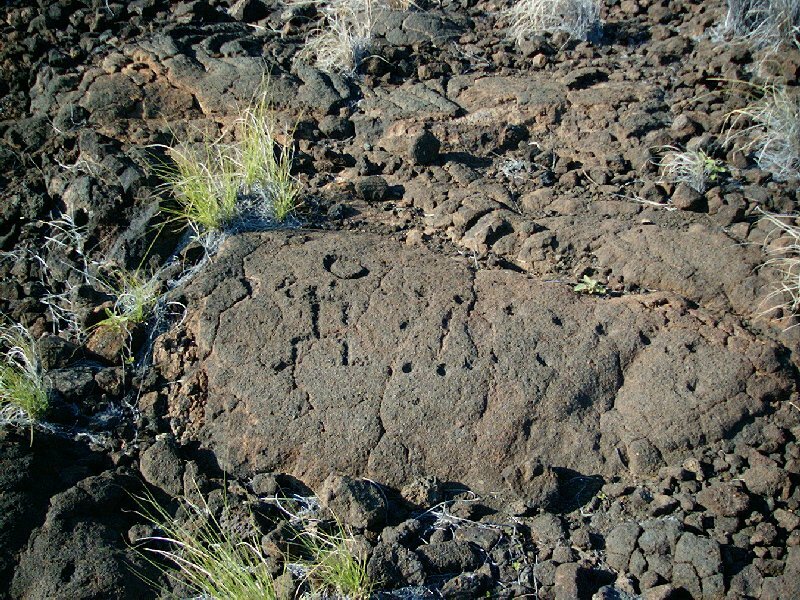 The juxtaposition of the rugged, arid lava fields, the irrigated landscaping, and the 13,767 foot high Mauna Kea was a vignette of the variety of the Big Island. 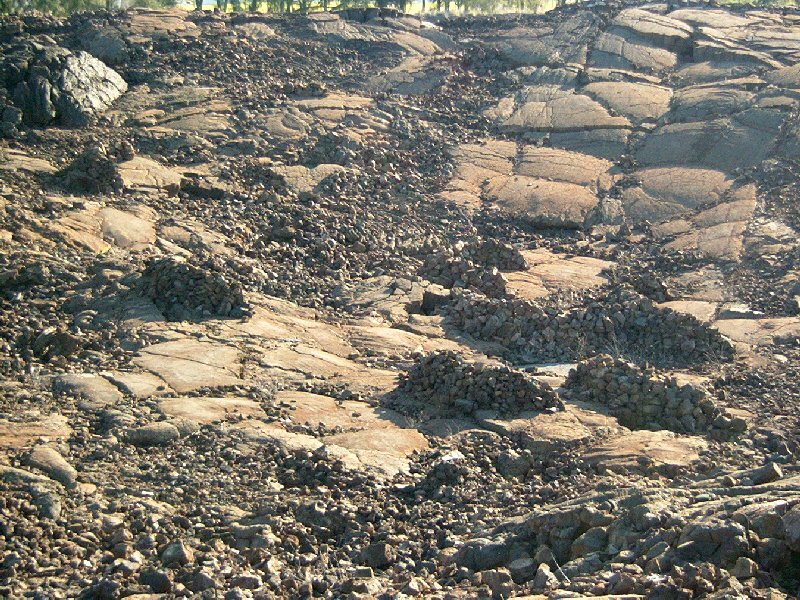 Travel across lava fields is rough! Back in the nineteenth century horses and mules needed a slightly smoother path to get from one town to another, so they built trails such as this one. 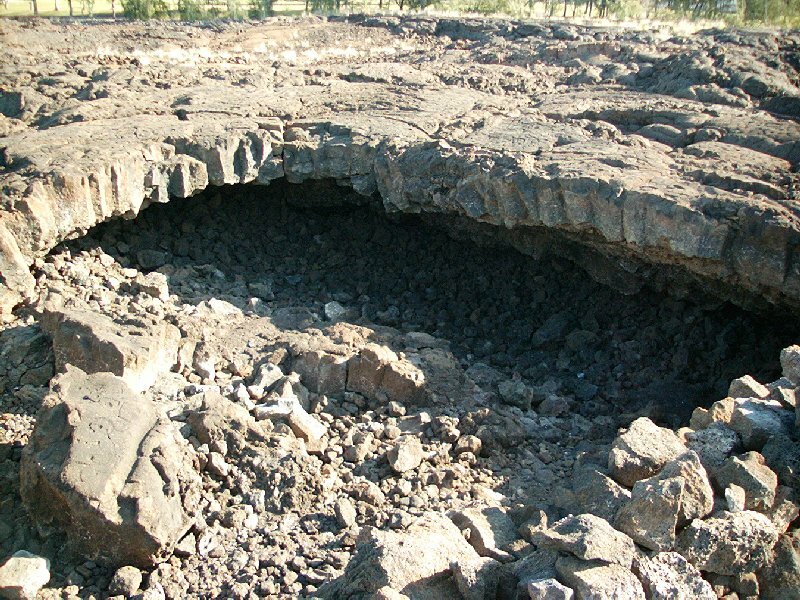 When evening fell (which happens rapidly in the tropics) travelers would take shelter in caves formed by collapsed lava tubes, or build semi-circular windbreaks from loose stones. The area we visited was at the boundary of two ancient kingdoms. The theory is that travelers would sometimes spend days here waiting for permission to cross. 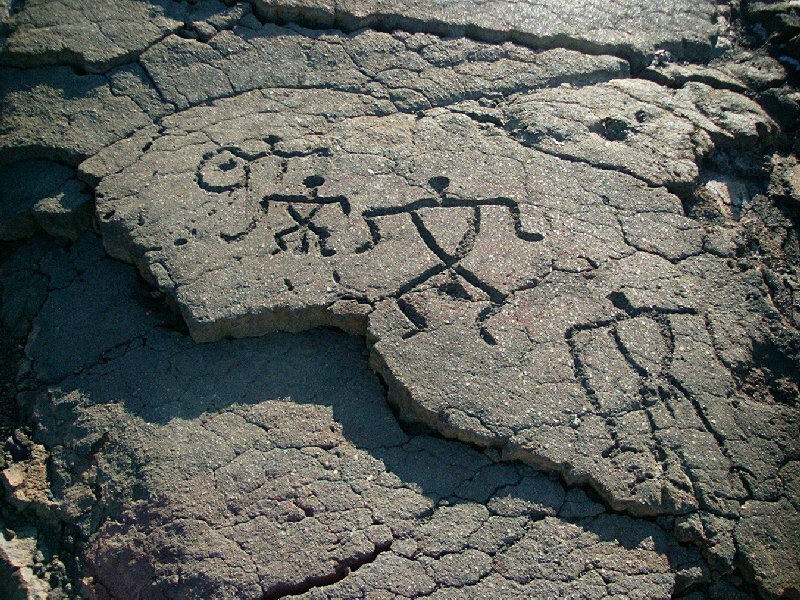 They recorded their presence by chipping these petroglyphs in the rock. The sets of circles and dots might have recorded the number of people in the party, or other details about the trip. 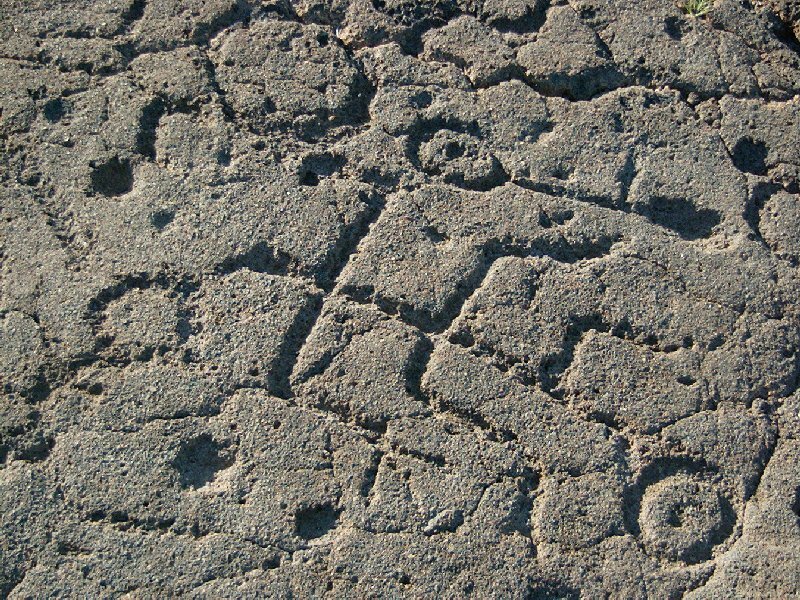 The practice continued into the 19th century as evidenced by the horse and rider and the written and dated inscriptions. ... and Sunday we flew home.